No starvation diet for "the Kimmer"
Waiting in line at your favorite grocery store is a guaranteed way to see the covers of magazines targeted toward women. It's a real challenge to find just one week of a year where the cover of at least one check-out tabloid doesn't have blaring headlines about weight loss or the most recent diet sensation. "Better than gastric bypass!" "Kim lost 200 lbs in 11 months!" "Christin lost 100 lbs in 5 months!" Those very comments appeared on the cover of the June 12, 2007 issue of Woman's World Magazine. The story was a fascinating look at a weight loss diet known as Kimkins, created by Kim Drake, also known as the "Kimmer." The Woman's World story begins by saying they sent out their spies to gather intelligence about Kimkins. The Kimkins website included numerous before-and-after pictures of not only the "Kimmer, but also happy members that had shed massive amounts of weight. Woman's World describes Kim as "smiling" when responding to questions. This implies that the Woman's World interviewer was personally watching the response of Kim Drake. So, you would think that Woman's World would have noticed that "Kim" was in fact a 300-pound woman. 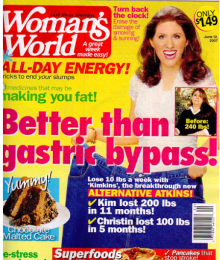 The Kimkins website saw a huge increase in memberships due to the flattering Woman's World cover story. Records introduced in connection with a class action lawsuit against Kimkins show that for the month of June, 2007, Kimkins pulled in over $1,200,000 in membership fees. So great was the response that Kimkins needed to hire a public relations spokesperson -- and there was no one better suited for the job than Christin Sherburne. Christin's picture had been featured on the Woman's World cover, holding a pair of old jeans next to the headline: "Christin lost 100 lbs in 5 months!" "I was excited about it," said Christin. "I've been overweight all my life, and even though I had never met Kim Drake in person, I wanted to tell others how they could finally lose the weight as I did." Soon the Kimkins machine was in full throttle. Members were reporting faster weight loss than they had ever experienced on other diets, and Christin was in P.R. mode in her new role as spokeswoman for Kimkins. But little did Christin know what would happen next. The job of a spokesperson is to represent your company and answer any questions that might be thrown your way, including those from the media. One day, Christin found herself facing questions that she couldn't honestly answer questions concerning medical claims and health issues related to the Kimkins diet. "As a spokeswoman, people would ask me questions that I couldn't answer, especially related to the medical safety of the diet," said Christin. Christin did the logical thing. She contacted Kim Drake, the founder of Kimkins. Christin sent a letter to the "Kimmer" in which Christin asked about medical claims of the diet. Is the diet safe? Are medical authorities backing the diet? All reasonable questions that any spokesperson needs to be able to answer. To Christin's dismay, instead of getting answers to her questions, she received a pink slip. Kim Drake had removed Christin from her public relations job and offered her a much reduced role moderating the Kimkins forums. While Christin might have been upset about losing her job, what was really upsetting was the fact she was losing her hair. "You have to understand that when you are seriously overweight, you are very vulnerable. I saw Kim's before and after pictures and when I was told that she had no ill side effects, I wanted to emulate her success," admitted Christin. "I did lose the weight, but I also lost a lot of my hair, ended up in the hospital with heart problems, and my menstrual cycle was all messed up. Now I'm on my journey back to a healthy lifestyle. "I have had a few physical problems resulting from following this diet as laid out specifically by the founder, Kimmer. I am suffering from severe and extreme hair loss," complained Rene of Milwaukee. "Yes, I lost weight. And now I am trying to recover, trying to save what is left of my hair, trying to learn to eat again." And Mary, of Allenwood, New Jersey, chimed in, "I lost a ton of hair, had dizziness, nausea, rashes, dry skin, and a loss of $59.95." As word spread about potential health issues, people were becoming more curious about the mysterious "Kimmer." Although her pictures and words were posted on the website, no one had actually met her in person, not even the people working for her. That all changed thanks to a keen private investigator with AllianceAgent.com. He staked out Heidi's location and snapped shocking photos of the person known as the "Kimmer." The woman didn't look anything like the "after" pictures on her website, and she certainly didn't look like she was following her own diet. In fact, Kim Drake didn't exist. 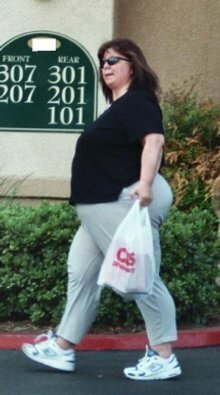 The "Kimmer" was really a 300-pound woman named Heidi Kimberly Diaz -- a woman with no medical expertise in weight loss. Websites and blogs began circulating these newfound pictures of the mysterious Kimmer, and as word leaked out, a class action lawsuit ensued from former Kimkins members. Additionally, ex-members repeatedly contacted Woman's World Magazine to let them know the truth about the woman they'd made rich. "She (Heidi) went on this false advertising campaign. I think I lost count at 35 false testimonials and false weight loss stories," said John E. Tiedt, an attorney and a member of the California Health Fraud Task Force. "We now know that many of these pictures came from Russian bride websites. Even the so-called Kimkins website administrator was a fake, all created by Heidi," Tiedt said. "She had already made close to $2 million, but when she heard litigation was heading her way, she began an elaborate plan that would make it appear her business would be bankrupt by the time litigation occurred. In reality, she had over a million setting in a bank account," Tiedt said. ConsumerAffairs.com contacted Heidi Diaz but she said she could not comment due to pending litigation. A few hours later, she e-mailed us a complimentary member pass to the Kimkins website. By this time we knew all about the bogus testimonials and pictures, but access to the members portion of the site gave us a closer look at the actual diet. "It's not just low fat, it's low everything," said Dr. Marc Siegel, a Fox News medical contributor and Associate Professor of Medicine at the New York University School of Medicine. "It's a starvation diet, pure and simple. If someone has an underlying medical problem and then begins this starvation diet, they are asking for trouble." Although the current Kimkins diet recommends a minimum of 800 calories per day, there are no maintenance plans and it's basically a one-size-fits-all diet. "It's disturbing that this is basically a one-size-fits-all diet," said Jennifer Ebelhar, a Registered Dietitian Instructor at Saint Louis University. "Some women might need 1200 calories and a man might require 4000 calories. You'll certainly lose weight on a starvation diet, but you will never be able to maintain the weight loss." Ebelhar checked the calories for what Kimkins calls the most popular diet, the "Boot Camp." "I randomly chose food combinations on the list and couldn't even reach 800 calories daily," she said. The Woman's World story said that, "Kim Drake worked with our nutrition team to create these super-slimming Kimkins menus." However, we could not find any nutritional expert that would endorse the Kimkins diet. "I don't know any dietician that would recommend this diet," Ebelhar said. "I second that," said Dr. Siegel. "I wrote a book about false fears, but the Kimkins diet is truly something to fear. The only other person that I know that gives more false medical advice is Kevin Trudeau." The Kimkins saga continues in the courts and although credit card accounts have been frozen, Kimkins now takes checks. Additionally, she has raised the membership price to $79.95. Our time on the Kimkins website showed that many people didn't care that many if not most of the claims were bogus. It was a cult atmosphere, with people attacking anyone that dared speak against Heidi and her diet. And although the membership fee is supposed to pay for a lifetime membership, we spoke with numerous people who had been banned from the site. We also saw the consequences of a classic starvation diet. Women who had quickly lost the weight started eating again, and then returned to the Kimkins site for encouragement to lose the weight again. "It is very addicting when you lose weight fast," said Christin. "I was very blind at that time, and I want people to know that I no longer endorse this diet. I just wish that Woman's World would have said that when they released their apology." It took eight months for Woman's World to admit its error. 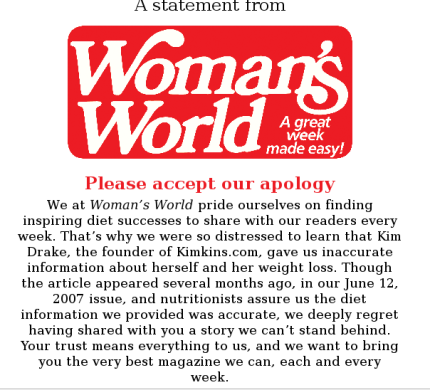 We contacted Woman's World by phone and e-mail but the magazine would only refer us to the statement on its website. Meanwhile, ex-members are starting their own blogs to spread the word and warn others. "Heidi is no different from many others on the internet," said Dr. Marc Siegel. "They know people need hope in connection with cancer drugs, HIV drugs, obesity, and if you have the ability to lie to people that need hope, you're gonna make a lot of money on the Internet."